To build and support a safe and healthy environment by reducing alcohol and other drug use and abuse. To engage diverse communities in a partnership to reduce the use and abuse of alcohol and other drugs through culturally competent, evidence-based prevention activities. "Primary prevention includes a set of activities or strategies that are research based and have produced evident outcomes, and include principles of effectiveness directed at individuals who do not require treatment for alcohol and other drugs. Under the Substance Abuse Prevention and Treatment (SAPT) Block Grant statute, early intervention activities are not included as part of primary prevention." The video explores the health risks of BINGE DRINKING - including unintended pregnancy, sexually transmitted diseases, injury, car crashes, violence and HIV/AIDS - and discusses effective community prevention strategies such as increasing alcohol excise taxes. The video also features experts who debunk common myths including the belief that BINGE DRINKING is only a problem among youth. Video length is 8:25, and may take several minutes to load over slow connections. Please be patient. 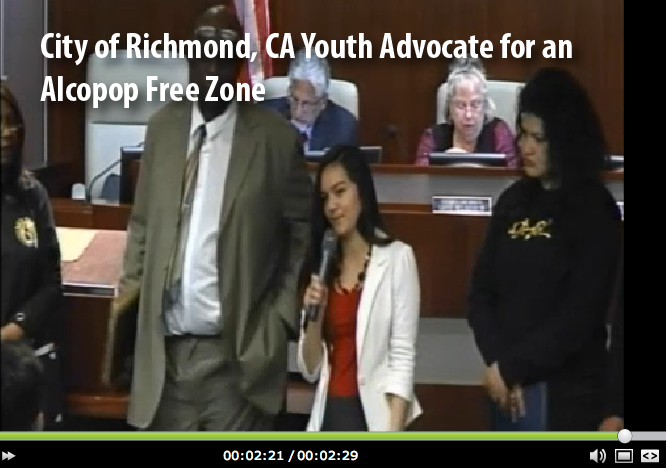 Bay Point and Rodeo teens describe their campaign to limit alcohol access for minors in an eight-minute mini-documentary video that made its broadcast in Contra Costa Television (CCTV), the county cable station. Assess community readiness prior to program implementation. Create capacity-building opportunities for the community. Promote shared leadership and decision-making. Use a community organizing approach to challenge social norms regarding AOD. Foster opportunities for joint planning, implementation, problem solving and evaluation of program outcomes. Ensure that the populations most affected by the problems are represented and involved. Acknowledge differential powers status between groups and populations. Value everyone's capabilities, skills, and experiences. Promote equal and equitable access to resources and opportunities. Promote an open and inclusive communication. Implement policies and practices that encourage conflict resolution and problem solving. Reach populations in multiple settings e.g. homes, schools, faith-based organizations, housing complexes, youth organizations, neighborhoods businesses, criminal justice and other institutions. Use multiple prevention strategies, e.g., environmental, alternatives, community based, education, information dissemination and problem identification and referral in order to best represent the community's needs. Promote strategic alliances and collaborative efforts between different community stakeholders. Develop and nurture partnerships that are willing to share risks, resources, responsibilities, and rewards. Conduct community needs assessment to determine relevant risk and protective factors. Plan, implement, and deliver evidence-based strategies, programs, and practices. Address all forms of alcohol and drug abuse, alone or in combination, including underage drinking, use of illegal drugs, and inappropriate use of legally obtained substances, including prescription and over-the-counter drugs. Evaluate and report program implementation outcomes. In "Reducing the Risk for Mental Disorder Frontiers for Prevention Intervention Research", the Institute of Medicine presented the full continuum of care model, which was adapted by Center for Substance Abuse Prevention in 2000, and required in 2003. Selected Prevention: Targets subsets of the population that are deemed to be at risk by virtue of their membership in a particular segment of the population — for example, children of adult alcoholics, dropouts, or students who are failing academically. Risk groups may be identified on the basis of biological, psychological, social, or environmental risk factors known to be associated with substance abuse (IOM 1994), and targeted subgroups may be defined by age, gender, family history, place of residence such as high drug-use or low-income neighborhoods, and victimization by physical and/or sexual abuse. Selective prevention targets the entire subgroup regardless of the degree of risk of any individual within the group. One individual in the subgroup may not be at personal risk for substance abuse, while another person in the same subgroup may be abusing substances. Since 2001, Alcohol and Other Drugs Services shifted prevention priorities and resource allocation to promote early identification of youth at risk of alcohol and other drug problems, by decreasing the allocation of universal prevention services while increasing the number of selective and indicated prevention groups in settings that serve high risks groups. GOAL 1. Reduce Underage Drinking 5% by June 2023. PROBLEM: Alcohol is the substance of choice among youth. Objective 1.1 By 2023, youth will increase their perception that underage drinking is harmful by 3% as measured by CHKS. Objective 1.2 By 2023, reduce youth alcohol access by 5% as measured by CHKS. Objective 1.3 By 2023, youth will increase social and interpersonal protective factors that mitigate risks for substance use by 5% as measured by CHKS. Objective 1.4 By 2023, collaboration with schools and community partners will increase by participating in 10 new collaborative events or trainings. GOAL 2. Decrease Youth Marijuana use 3% by June 2023. PROBLEM: Marijuana is the second most widely used substance among youth. Objective 2.1 By 2023, reduce access to marijuana by 3% as measured by CHKS. Objective 2.2 By 2023, youth will increase their perception that marijuana use is harmful by 3% as measured by CHKS. Objective 2.3 By 2023, prevention system workforce capacity will increase through implementation of 10 new tools or trainings focused on marijuana. GOAL 3. Decrease Youth Prescription Drug Abuse and Misuse 1% by June 2023. PROBLEM: Overdoses due to prescription drugs like opioids and sedatives have been increasing in the County. Objective 3.1 By 2023, youth will increase social and interpersonal protective factors that mitigate risks for substance use by 5% as measured by CHKS. Objective 3.2 By 2023, youth and community members will increase their knowledge about the risks of Rx abuse/misuse and safe disposal by 50% as measured by pre-post tests. Objective 3.3 By 2023, collaboration with medical and community partners will increase by participating in 10 new collaborative events or trainings. The Partnership Information and Referral Line, the Community Partnership, as well as AOD community based agencies provide information and referrals, produce and disseminate materials of available resources and existing services. Every year, the Community Partnership coordinates and supports community based campaigns to raise awareness such as Alcohol Awareness Month (April), People Who Make a Difference (May), National Recovery Month (September), Red Ribbon Week, and National DUI Prevention Month (December). Prevention education services are directed to affect critical life and social skills, improve decision making and refusal skills, enhance adolescents resilience, increase knowledge about alcohol and other drugs, decrease adolescent's use of alcohol and other drugs, delay onset use of alcohol and other drugs, increase knowledge about environmental factors that promote AOD use including alcohol outlet density, alcohol marketing, irresponsible sales of alcohol, sale of paraphernalia etc. Most of the educational programs are based on Middle Schools, for example Project Success, Creating Lasting Family Connections, Towards No Drug and Alcohol Abuse, and the Parent Project. The Partnership Information and Referral Line provides resources and information to the community. All education based prevention programs also incorporate components of screening and brief intervention, including the Women's Prevention program at 3 Health Clinics. The Community Partnership staff acts as a broker/facilitator working in collaboration with the Alcohol and Other Drugs Advisory Board, Communities Against Substance Abuse (CASA), Resident Councils, Healthy Neighborhoods Groups, Police Departments, Municipal Advisory Councils, PIRA, youth groups, etc. Alcohol and drug free events are activities and trainings that promote healthy life styles, develop leadership skills among youth, community residents, parents and persons in recovery. Some examples are Friday Night Live, Club Live, Community Initiatives, and public forums, etc. Utilizing the public health approach to prevention, this strategy aims to establish or change community standards as a way to influence the incidence and prevalence of alcohol and other drugs abuse among the general population. The Community Partnership provides technical assistance, access to training, resources and coordination to support the alcohol and other Drugs Advisory Board, and the Partnership's Forum environmental initiatives. The Community Partnership staff is actively involved in mapping the number of alcohol outlets, building resident coalitions, providing responsible merchant education, window signage and store compliance with the Alcoholic Beverage Control (ABC) regulations. The staff, in collaboration with other public service organizations, in particular ABC, collects factual information to enable local decision making groups to approve or deny incoming alcohol licenses, tracking substance abuse indicators in Contra Costa County, facilitates ABC 101 trainings to local residents, support community residents in the development of policies aimed at regulating alcohol sales.